Floating bridge bays rocked side to side as Fort Riley soldiers maneuvered a 124,000-pound tank across Milford Lake Friday morning. 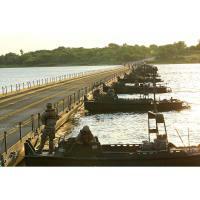 The bridge crossing was part of Fort Riley’s monthlong Gauntlet training. Friday morning’s exercise, called a wet gap crossing, is not often conducted during trainings, said Joey Sullinger, 1st Infantry Division public affairs officer. Sullinger said it’s an important exercise to build readiness. “The enemy could destroy a bridge and we still have to get across,” he said. Soldiers built a temporary, 2,000-foot bridge across an eastern portion of the lake in about 14 hours. They used trucks to back boats into the lake, then deployed 12,000-pound bays, or pieces of the bridge, which the boats pushed into place. Soldiers then attached the bays to each other and placed ramps at each end. Fort Riley’s 1-16 Infantry Battalion of the 1st Armored Brigade Combat team moved almost 50 vehicles and a couple hundred soldiers across the bridge. The battalion worked with units from Fort Leonard Wood, Missouri; Fort Hood, Texas; Fort Knox, Kentucky and the Louisiana National Guard for the exercise. A 1,000-pound cement block, placed in every third bay, helped anchor the bridge. In order to keep the bridge in line, soldiers used 15 boats to keep the bridge straight. Drivers in military vehicles — Abrams tanks, Bradley fighting vehicles and Humvees — moved slowly across the bridge, waiting for directions from soldiers walking next to the vehicle and soldiers at the end of the bridge signaling the vehicle forward. Clouds of dust trailed each vehicle as it went up a hill. Maj. James Wiltse, 1-16 infantry battalion executive officer, said the soldiers were given a scenario that morning but the enemy constantly changed, allowing the soldiers to practice their decision-making “on the fly,” Wiltse said. He said the training opportunity to cross a floating bridge was “once in a lifetime” for some of his soldiers. After crossing the bridge, the battalion traveled about a mile north for a new objective, continuing their training.